Vehicle Barriers are primarily designed and requested due to their trouble-free installation and use, and because site needs a practical solution to security or parking control. We have a full range of barriers, called the ‘FA6000’ range, all of which conform to BS6571. They are designed for long-term reliability and only require a single-phase power supply. They provide a smooth, consistently reliable operation, incorporating a 3-phase driven motor and gearbox drive. They will work with a full range of access control, of which we are happy to supply and install. 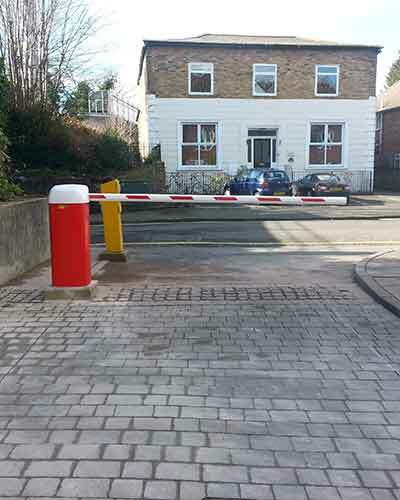 All of our vehicle barriers can be interfaced with existing or new access control. Once the vehicle barrier is opened, it will remain open for a preset time, usually variable between 0-120 seconds, and then will automatically close provided that all safety features have been cleared. In the event of power failure, the barriers drive system has a manual hand wind, meaning it is still possible to raise and lower the barrier. This is located within the lockable cabinet so that only a keyholder can access it, therefore security is not compromised.